Here are photos of some early Bronaugh residents that have been shared. Grave marker for William and Anna Twigg. Moundville Cemetery, one half mile west of Moundville, Missouri. William Twigg was a railroad contractor. He had a crew of laborers that built the rail lines. 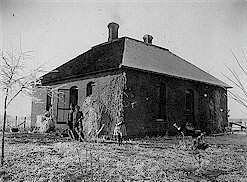 William Twigg donated the property so Prairie Flower School could be built. August Bartles Twigg, eldest child born to Anna Catherine (Stadtmann) Twigg born 27 Aug 1872 in Chariton County, MO. August was adopted by William Twigg in 1875 and thus carried the Twigg name. This is his wedding to Grace, maiden name unknown. In 1906 August B. Twigg moved to McAlester, OK. They only had one child while in residence of Bronaugh, a son, Harley Twigg. Lona Belle Sherrell-Twigg ( 1881 - 1961) wife of John William Twigg (1875 - 1935, son of William and Anna C. Twigg) . Buried in Worsley Cemetery. 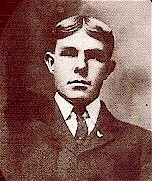 A photo of August Bartles Twigg taken in Nevada, MO. He resided with the Twigg family in Vernon County until he married and moved to McAlester, OK and died in McAlester, OK 1953. He had but one child, a son: Harley Twigg. August went to schools in Moundville. This photo is taken around 1910-1915 since he resided in McAlester, OK in the 1920 Federal Census. John Wayne Twigg was the youngest child born to John William and Lona Belle (Sherrell) Twigg (7 Aug 1910). He was attending Prairie Flower in 1917-18. Myrtle Josephine Twigg aged 3 1/2 months and Lois Enid Twigg aged 6 years -- year taken 1907. Daughters of John William and Lona Belle Sherrell Twigg. Myrtle was born August 12, 1907 and died May 16, 1909. Buried in Worsley Cemetery. Another photo of Lois is in the 1910 Prairie Flower School photo. John Wayne Twigg (7 Aug 1910) went by the name of Wayne Twigg. He inherited the family farm and farmed it for awhile.John Wayne Twigg married Veva Adams, and they had 5 children He died 12 Nov 1975 in Eudora, Douglas, KS and was buried at Worsley Cemetery, Bronaugh. Samuel Twigg was the only child born to Fannie and William T. Twigg. Samuel Twigg was born 27 Feb 1885 in Bronaugh, Vernon, MO. Samuel is buried in Oakland, Indiana County, PA having died 30 Apr 1959. Samuel married Emma L. Henneman on 5 Mar 1913 in Bronaugh, Vernon, MO. They had four sons: Orland, Donn Stewart, Edwin J. and Laverne Twigg. All four sons were born in Indiana, Indiana, PA. Samuel attended schools in Bronaugh. After William T. Twigg's demise he worked as a hired man farm labor. The individuals are: John Claude Lucas and his wife Laura Josephine Hudiburgh. The girl is Stella A Lucas, born 2 Aug 1889 in Vernon County. She met and married her husband, Robert Newlin Armstrong. He also was born in Bronaugh, Vernon, MO in to Rufus Pinkley Armstrong and Susan Elizabeth Doores; 24 Feb 1887. There was a time that the Twigg property was sort of a cluster of Twigg (next door property) Terpening, Hudiburgh and Lucas. Nelle Twigg was the youngest and last child to William T. Twigg. Nelle was born to William and Ollie Terpening-Twigg 12 Aug 1894. It is known that for a time she spent with the St Francis orphanage. Nelle did marry a Daniel Perkins (also of Moundville) on 20 DEC 1910. Nelle was only 16 yrs old at the time of her marriage and needed a guardian to sign consent. On the certificate it indicates a J. N. Coin as being the guardian for legal consent. Interestingly enough, Daniel appears in the 1920 federal census back home with his mother Huldah Perkins as being single and working as a coal hauler. I knew that Nelle had married twice but didn't realize that the marriage ended in such a short time. Lower photo is of Nellie Twigg Perkins shared by Dale Brown. Right: Obituary from Laverne Twigg, son of Sam Twigg. From the February 26, 1919 Bronaugh Journal. 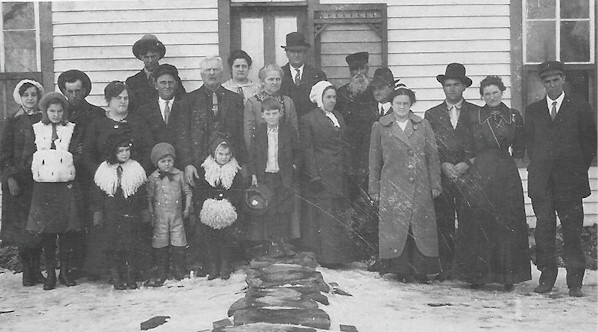 Joy also sent this photo that we are in hopes that someone will be able to help in identifying some of the folks.The photo was taken, obviously in the winter but she is not aware of the location probably at John William Twigg's home. "John William Twigg is the white haired ,am, wearing a suit and tie, mouth ajar in the middle slightly to the left. Behind him is Lona Belle Sherrill and off to her right is a young man, tall and dark and that's Charlie Twigg. After William T Twigg died in 1903, Charlie stayed and worked on John Williams' farm then moved on. By then he was the eldest at the farm and decided to strike out on his own. He knew his brother Ernest Twigg (Olive and Wiliam Twigg's son) was living in Montana so he traveled west to be with Ernest. Without much luck Charles moved west again to be with his older half sister, Catherine Twigg Lucas (my grandmother). Charles never married. He never got to finish school and just worked odd jobs to stay alive. He was what the family called A Gentle Giant since he was so tall. He enjoyed with with his cousins and remained in Oregon. " So if anyobne has a duplicate of this image where they are identified, that would be great. But that is pretty unlikely, so we hope to piece together id's. It is possible these are Twigg's and Sherell's instead of being all Twigg's.